An iconic reverse design, limited mintage, and a sleek, proof finish – collectors across the globe eagerly await the arrival of the 2018 1 oz Isle of Man Angel (Proof) silver coin. Only 15,000 will be issued worldwide so be sure to order early with coininvest.com to avoid disappointment. This stunning 2018 1 oz Isle of Man Angel silver proof bullion coin is an inspired addition to any collection. The Angel, as it’s fondly known, is one of the world's most coveted coins and valued for its outstanding design features as much as for its relative rarity or silver content. The original gold Angel coin was introduced by Edward IV in 1465. It was based on the French Angelot or Ange, a French coin that also took its name from its Archangel Michael slaying the dragon design. The Angel was said to bring good luck and promote health and was handed out to those suffering from the disease known as scrofula or "King's evil" during medieval times. Each 2018 1 oz Proof Isle of Man Angel is struck from one ounce of .999 pure silver and manufactured to the highest standards. An exceptional proof finish allows you to enjoy every intricate detail of its wonderful reverse design. The 2018 1 oz Silver Proof Isle of Man Angel stays true to tradition and shows the Archangel Michael and that unlucky dragon. Spear in hand and ready to strike, Michael carries a shield to protect him from the beast's fiery breath. The first silver Angel was introduced by the Pobjoy Mint in 1995 and issued each year until the mint's contract with the Manx government expired in 2016. Now issued by the Tower Mint, these magnificent 2018 1 oz Silver Angel proof coins are as sought after as ever. 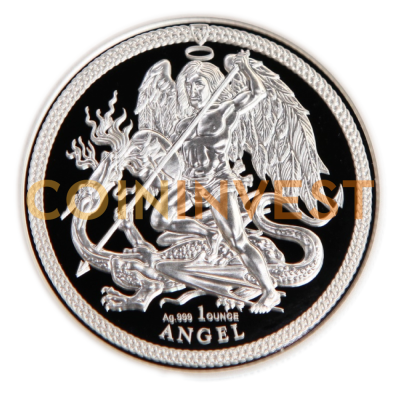 Order today with coininvest.com and beat the rush for the 2018 1 oz Isle of Man Angel silver proof coin. The coin's immaculate proof finish allows you to fully appreciate each fine detail. Keep your coin in pristine condition - add gloves and one of our specially designed capsules or display cases to your cart.